Ankle-length slip-on trousers "Slim Fit – CS" by TONI. Design ­JENNY STRIPE with normal waist height, comfortable waistband and narrow thigh. The perfect combination of fashion and sportswear in a trendy feel-good look! 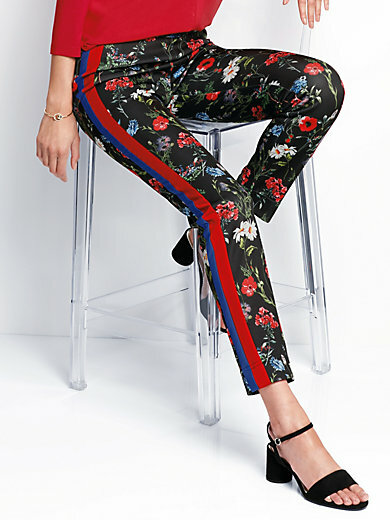 In super-­elasticated techno-stretch fabric with trendy floral print, wide two-tone stripes, and 2 back patch pockets. Made of 95% polyester, 5% elastane. Inside leg length approx. 29ins. Ankle width approx. 11ins. The trousers are machine washable.